With many women facing harassment and violence in public transport, cities should prioritize women’s safety in an inclusive transport planning process. Photo by Benoit Colin/Flickr. A city cannot be inclusive without ensuring women’s safety in public transport. Women often remain a vulnerable part of the transit users, as many face violence, verbal harassment, physical abuse and discriminatory graffiti messages in stations. For example a third of women in London have been verbally abused in city’s transport; and in Mexico City, 7 out of 10 women riding public transport have faced gender-based violence. Studies have shown that in many cities, women use public transport differently than men, given their unique needs and roles across cultures. Some cities have experimented with segregation-based and infrastructural solutions, such as women-only compartments in metros, gender-specific cabs and hail rides, and greater police forces around well-lit walking areas. However, some of these solutions are controversial for segregating public transit for males and females. Several public agencies have embraced public awareness campaigns as a critical tool for reframing the transit safety problem for women. Here are two cases of leaders focusing on citizen engagement and changing public perception in order to make public transport safer for all. 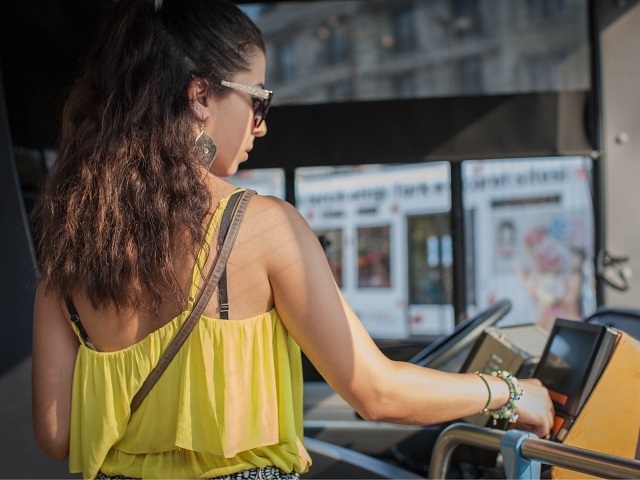 In July 2015, the French government launched a public awareness campaign in cities all across France to stop the violence women face on public transport. The government found that 100 percent of the 600 women surveyed had suffered harassment in public transport at some point. As part of the campaign, posters calling for more awareness on sexual harassment have been placed across major transit stops. The posters read “Stop – that’s enough”, and advise women on how to react by urging fellow passengers to look up from their smartphones and pay attention, and reminding aggressors that this behavior can lead to prison time. The goal of this campaign is to improve the daily lives of women. The Ministry of Social Affairs, Health and Women’s Rights aims to give everyone the tools to react, to change behavior so that no aggression is trivialized. A pamphlet from the Busao Sem Abuso (“Bus With No Abuse” in English) campaign in Curitiba, Brazil. Photo by Neha Yadav. Buses are the main form of transport for most Brazilians. About 45 percent of Curitiba’s population uses public transport, and a large majority of travelers are women. Many women in Curitiba are verbally and physically abused and subjected to violence on a daily basis while travelling in buses. 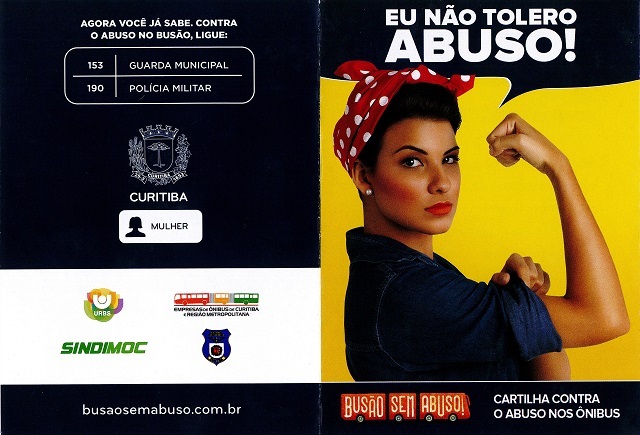 Curitiba City Hall’s “Bus With No Abuse” (Busao Sem Abuso) campaign, created in association with Curitiba’s bus companies and the Syndicate of Bus Drivers, instructs both male and female passengers and public transport employees to catch sexual abuse cases and to speak up and report such cases with the municipal authorities. This online and print campaign defends the rights of the women as per Mayor Gustavo Fruet, whose council previously rejected the idea of women-only buses. The campaign strongly encourages women to speak up when they face abuse or prejudice in buses, and provides protection through immediate phone access to municipal guards and police. Inspired by the famous “We Can Do It” poster of J. Howard Miller, this campaign also has a Facebook and Twitter platform, where women and girls can upload their pictures in the poster style to show their support for safer buses for women. Many more cities and public bodies need to take action to include gender–related transport needs in transport planning. Transit services and facilities must ensure the safety of women and girls. Travelling in public transport without fear of abuse or discrimination should be a priority for transport planning, as safer transport is a crucial element of a livable city.